Croeso i wefan Penseiri George + Tomos / Welcome to George + Tomos Architects website. George + Tomos was established in 2003 by Arwyn George and Dafydd Tomos. They have both earned a great deal of experience in the education, health, public and private sector projects throughout their careers. The company is based in Machynlleth and operates throughout Wales and beyond. We offer a bilingual service and are happy to consult and prepare documents in both languages. Both directors are fluent in Welsh, and on every project one of the two directors will take a lead role in the work and work closely with the rest of the team. As a company we aim to combine creative design ideas with the use of sustainable construction techniques. We are a young team with wide experience with a real passion for our work and aim to ensure the best possible results for our clients. We aim to make buildings that work well, make the best possible use of site and the budget, are technically and ecologically advanced, light and airy, informal and comfortable, suit their surroundings but also make a strong statement. We have extensive experience of working in partnerships with our clients to provide sustainable solutions. We employ 7 staff in total; 2 Directors, 3 experienced Architectural Technicians, 1 Architectural assistant RIBA Part 2 and 1 Office manager who takes care of the administration. Full CV's are available on request. We are members of the AECB (Association for Environmentally Conscious Building), RIBA (Royal Institute of British Architects), and are Constructionline approved consultant. We carry Public Liability, Employee Liability and Professional Indemnity Insurance. Our Health and Safety Policy, Equal Opportunity and Environmental Policies are available by request. The project won the Powys LABC Best 'Public Service Building' category award 2015 for Contractor Ian Snead' work in renovating this 140-year-old hall in Newtown, Mid Wales on behalf of Mid Wales Food and Land Trust. Specialist 12-bed Renal Dialysis Unit at Victoria Memorial Hospital, Welshpool. The project was also submitted to the national awards for consideration. Provisionally rated as BREEAM 'Very Good' whilst also achieved ‘Excellent’ standard in terms of its energy performance. 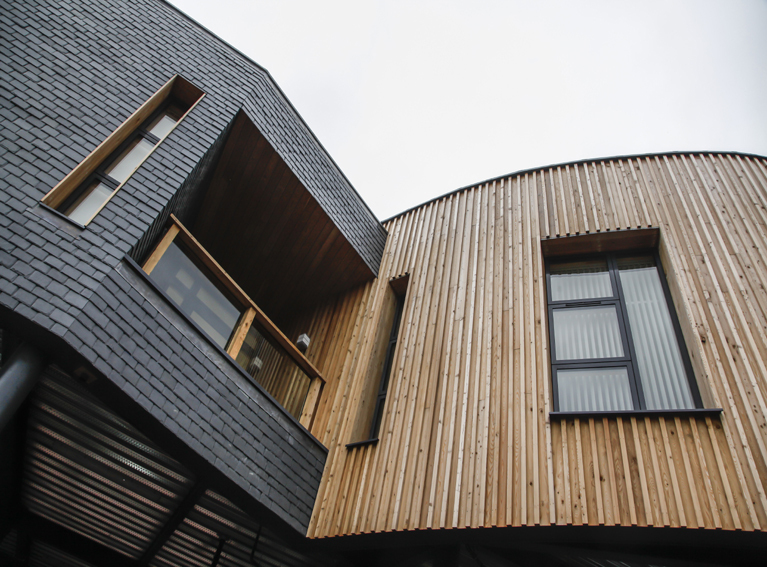 The project involved a series of buildings and landscaping which including the Birdhyde as well as Classrooms, Observation Tower, Car Parks and Toilet Facilities - all being self sufficient, creating their energy and resource needs from the Sun, wind and rain. A private dwelling of our's, completed by Tai Dyfi Homes and was also submitted to the national awards for consideration. We worked with C.A.T. (Centre for Alternative Technology) to provide a facility which provides electricity and heat for the center. The design was carefully considered to ensure that the large turbine room and chip store was shoehorned into a discreet area of the site. Unfired clay bricks and self coloured lime render were used to win the project a nomination from the National Brick Awards. George + Tomos Architects were finalists in the Future Works, Passivhaus Competition to design the Welsh Passive House. The scheme for the Welsh Assembly and Blaenau Gwent Council was to combine the principles of the Passivhaus pioneered in Germany with the higher levels of the Code for Sustainable Homes in Wales, levels 5 with an option for level 6. As one of three firms shortlisted in the Welsh Passivhaus Competition run by BRE Wales and WAG to develop a full design to reach the Passivhaus and Code Level 5 – George+Tomos further developed the design to reach Code Level 6 - Zero Carbon Standard. Architect Dafydd Tomos of George + Tomos Architects was the architect responsible for the first large scale, non-domestic biomass building in the UK which involved a Combined Heat and Power plant. This transformational projects aimed to make a whole University campus a net exporter of renewable energy. Opened in 2006 the new building houses a Power plant that is fueled from wood fuel and crops grown on the University's own estates farm.